Last Sunday we all drove to the in-laws to visit. If I didn’t get along with my in-laws I would still drive down there just for the food! My husbands mother is an amazing cook. I have learned new things from her. His family stretches back into the Mennonite religion. His parents aren’t Mennonites and neither is he. I’m not entirely sure who is what. But I do think its his uncle and then from there are Mennonite. I’ve been trying to piece that all together for a long time. Anyway, I do know that his mom has kept a lot of the Mennonite traditions. Including cooking. Everything is homemade. From huge (full table) dinners to Chinese egg rolls and pizza. They rarely do take out. So this past Sunday we had an open fire meal. We made Mountain pies and had seven layer salad on the side. I fell in love. As simple as it is, I still thought it was just fabulous! I just had to make it myself. In a large, clear, bowl (or any) combine the ingredients. Layer each ingredient, one on top of the other by favoring the outside of the bowl. By doing this the layers look more full and pretty. Then fill the center with extra lettuce. 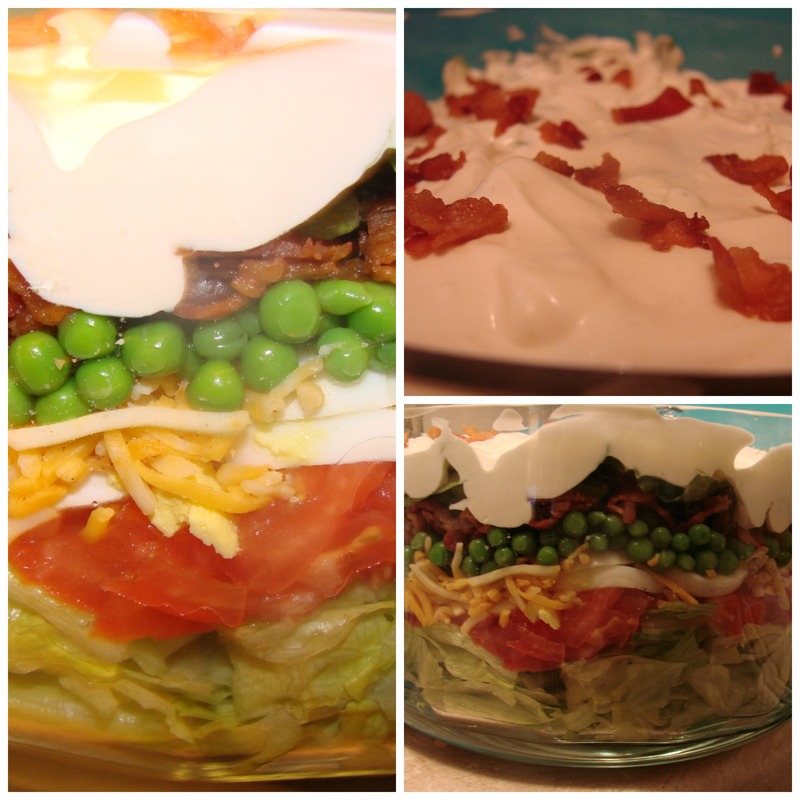 Place the dressing on top and garnish with bacon. I made extra eggs and bacon for future salads. You don’t have to use that much. I also added a little extra dressing. For a while now I have had an abundance of zucchinis just piling up on the counter. I didn’t know what to do with them. My mom kept saying shred them up and freeze them. Well people who know me, know I am a huge procrastner. I never did it. So yesterday I sat pondering what I was going to make for dinner. At last I looked at the poor zucchini sitting so lonesome on my counter. Well might as well put it to use. As the summer comes to a close there wont be too many more chances to use them. So here it is. 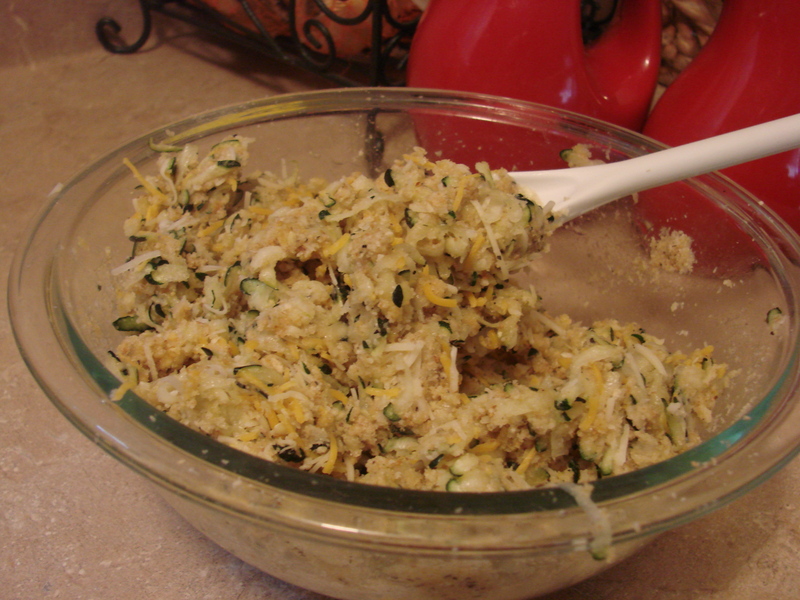 1 Zucchini grated. You will need to squeeze out the excess water in the zucchini by putting it in a paper towel and squeezing to release the water. Heat olive oil in a frying pan on medium heat to warm the oil. Combine all ingredients except the oil into a medium bowl. Mix throughly. Scoop up the mixture into balls, and flatten them out to make patties. Once pan is heated, place the patties and cook until golden brown. Flipping once about 3 minutes per side. That is it. Your done. I hope you enjoy these. I feel in love with them. 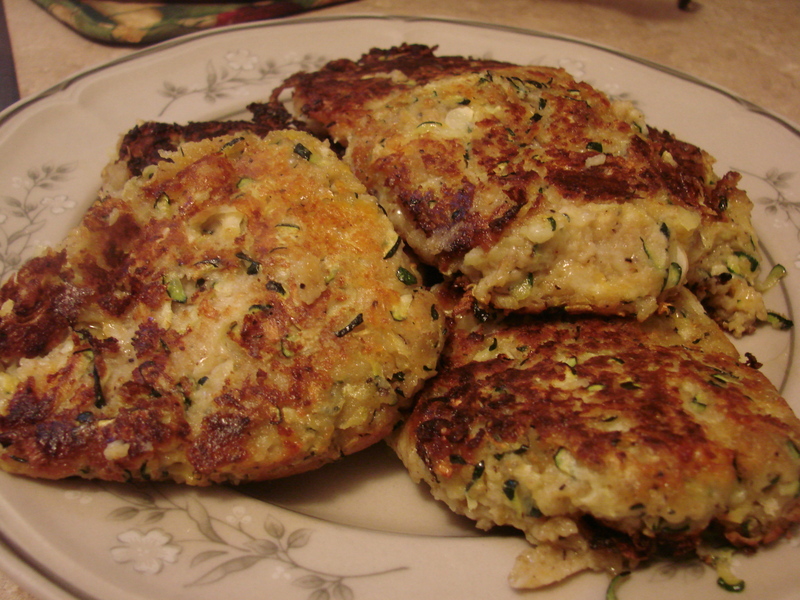 The whole time I was making these I kept thinking of hash brown patties. Which aren’t my favorite. So I thought I wouldn’t like them. However the taste is not what you would expect. Enjoy. My most favorite summer salad is the infamous Ramon Noodle Salad. The sweet and tangy taste is absolutely worth the time to make it. 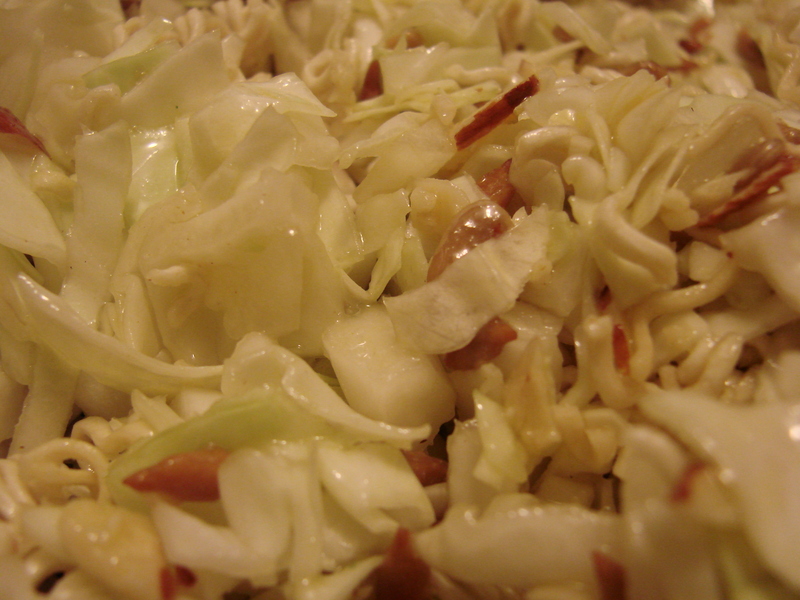 Cut a half a head of cabbage into slivers or small chunks. Shred the carrots using a grader. 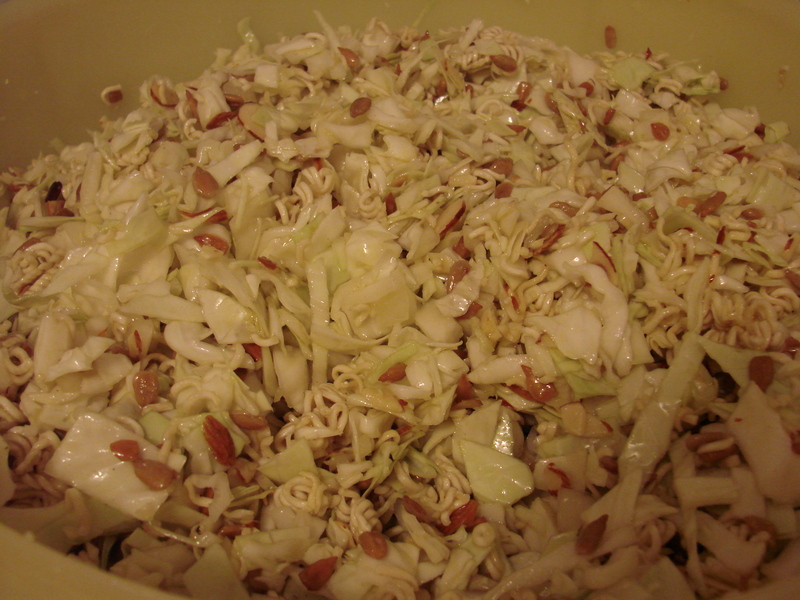 Add sliced almonds, sunflower seeds, carrots and ramen noodles. It’s best to let dressing sit in fridge for a few hours so the ingredients can blend together nicely. But definitely not necessary. You can eat the salad right away however I prefer to eat it the next day so the dressing is soaked though out the salad mix. *There aren’t carrots shown in this picture.